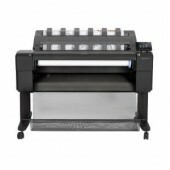 The first large-format printers with an integrated output stacking tray. Front roll loading for fast, effortless change of media. Easily review your print output as it's produced. Mobility features that let you access and print projects from virtually anywhere.